One might believe that the photograph reproduced here was made by Moholy-Nagi, or Kertesz, but it would be difficult to believe that it was made before the twenties. Certain possibilities concerning the appearance of the world first surfaced at that time, just as different possibilities had revealed themselves in previous periods, and would reveal themselves in future periods. It is, if one focuses on the fact, astonishing that no one had drawn or painted or photographed a picture quite in this spirit before 1920 A.D., although there was no technical reason why it should not have been done half a millennium earlier, in the square of San Marco. Perhaps the point is that new pictures are derived from old pictures, just as in biology new species are derived from existing species. In both cases, deductive leaps are not really possible. Although there are many missing links in our art historical knowledge, none was skipped as the chain was forged. Pictures from high vantage points were not really new in the twenties; it is rather a question of what one sees from one's vantage point. 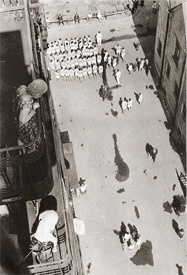 Alexander Rodchenko called his photograph "Assembling for a Demonstration," but he has inverted the hierarchical importance of the elements of his picture, and shows us chiefly a woman with a dustpan, sweeping, another woman watching, a vertiginous perspective, and a pattern of spots on the street, the most important of which are not the demonstrators but the stains left, perhaps, by a leaky street sweeper. 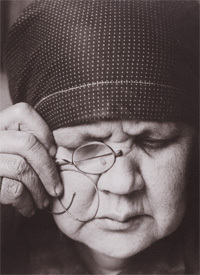 Rodchenko was one of the most important of the modern Russian artists who emerged after the revolution. 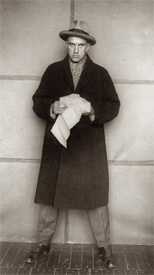 He was a distinguished avant-garde painter, graphic designer, and photographer during the heady period of the twenties in Russia, when artists' faith in the revolution had not yet seriously eroded. Best known of the Russian avant-garde artists of the interwar period, Rodchenko has gained ever more attention over the last two decades. The final canonization came in the form of this year's major Museum of Modern Art retrospective. Organized by Dabrowski, senior curator in the department of drawings, this is the first American exhibit to survey his entire career and look at his work in painting, drawing, design, and collage as well as photography. This catalog reproduces all the show's selections, which are valuable for their breadth and high quality more than depth in most areas. This is the most complete volume published outside of Russia to capture the photographic work of Alexander Rodchenko, one of the former Soviet Union's greatest artists. 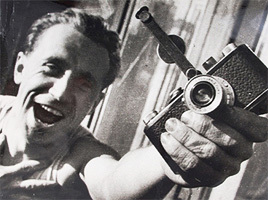 In it, Alexander Lavrentiev, grandson of the photographer, includes more than 400 pictures reproduced under a broad categorical structure that allows the reader to gain insight into Rodchenko's work. Following World War I, a new artistic-social avant-garde emerged with the ambition to engage the artist in the building of social life. 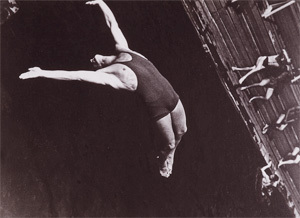 Through close readings of the works of Alexander Rodchenko, El Lissitzky, and Laszlo Moholy-Nagy whose careers covered a broad range of artistic practices and political situations, Victor Margolin examines the way these three artists negotiated the changing relations between their social ideals and the political realities they confronted. Focusing on the difficult relationship between art and social change, Margolin brings important new insights to the understanding of the avant-garde's role in a period of great political complexity. This book contains all of the diaries, programs, essays, and major articles written by Alexander Rodchenko between 1911 and 1956.